The incredibly talented and multi-faceted actor Ed Asner starred earlier in his acting career as the sinister Bart Jason in the 1967 blockbuster Western, “El Dorado” opposite legendary actors John Wayne and Robert Mitchum. The bad guy persona established, he later played the role of corrupt re-tired Chicago FBI agent Guy Bannister, pistol whipping fellow actor and friend Jack Lemon in Oliver Stone’s 1991 blockbuster film, “JFK”. A versatile actor able to shift gear and play exact opposite roles, he transformed himself on the big screen from sinister nemesis to soft spoken and kindly Mr. Carl Frederickson, the senior citizen animated hero starring in the 2009 blockbuster, and Oscar winning best picture “Up” which collected $293 million at the Box Office and to multiple screen appearances as Santa Claus. Ed runs the gamut of dramatic and comedic roles, and has more than one hundred TV credits to his name. 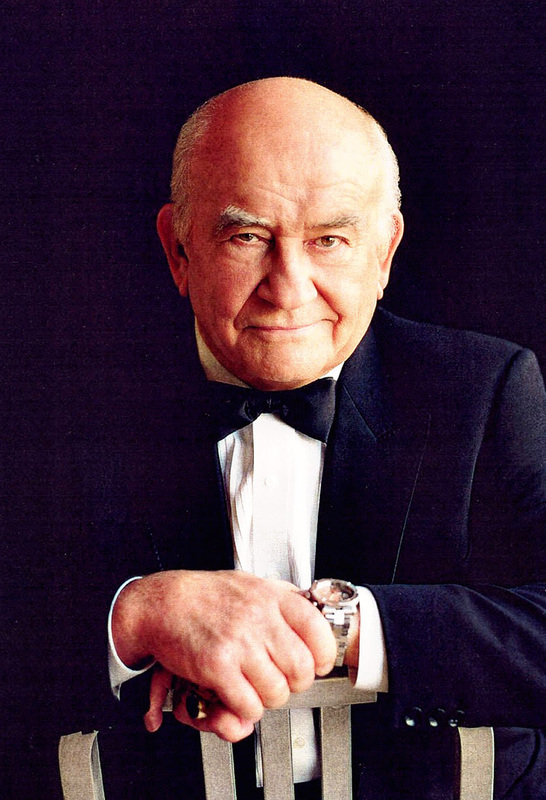 One of the most honored actors in the history of television: Edward Asner has been the recipient of eight Emmy Awards and 16 nominations, as well as five Golden Globe Awards and served as National President of the Screen Actors Guild for two terms. He was inducted into the TV Academy Hall of Fame in 1966. Asner received the Ralph Morgan Award from the Screen Actors Guild in 2000, presented periodically for distinguished service to the Guild’s Hollywood membership. In March 2002, he was again honored by the Guild as the 38th recipient of the prestigious Life Achievement Award for career achievement and humanitarian accomplishment, presented annually to an actor who fosters the highest ideals of the profession. No Hollywood actor has stood as tall as Ed Asner in challenging questionable if not illegal government practices and policies. In the 1980’s as Screen Actors Guild President, he supported raising money for medical aid to assist citizens of El Salvador during a civil war where the US government under Ronald Reagan was supporting death squads in that beleaguered country. At that time, the popular Lou Grant show was dropped by CBS, he was black-listed in Hollywood and threatened. Nevertheless, in later times Ed stood tall again with Architects & Engineers for 9/11 Truth who questioned the official story of the 9/11 Commission with scientific evidence. Asner supported AE911Truth and narrated an excellent expose called, “Solving the Mystery of Building 7 “. Today Ed is a Board Member of the Lawyers Committee for 9/11 Inquiry which recently submitted a Grand Jury Petition on 9/11 to the United State Attorney’s Office in the Southern district of New York City documenting the use of bombs, explosions, nano-thermite, controlled demolition to destroy the World Trade Center complex, which is contrary to the ‘”official government story” that office fires brought the Towers down, and suggestive of an inside job. The US Attorney now has a legal obligation to present real evidence of the 9/11 crimes to the Grand Jury, to begin a proper investigation. Principles and Truth are most important to Ed Asner. Presently, Ed is touring in the very funny and educational one- man show, “A Man and His Prostrate”. written by Ed Weinberger with whom he recently co-wrote his book, The Grouchy Historian published by Simon and Schuster. This entry was posted on Sunday, August 5th, 2018 at 8:48 pm	and is filed under 9/11, Education, Freedom, Geopolitics, Globalism, Human Rights, Justice, News, People, Politics, Protest, Quantum, War Crimes. You can follow any responses to this entry through the RSS 2.0 feed. Thank you. We are all honored to hear you You are two great Americans, great human beings, great citizens of our Earth. We are blessed and God bless you.